Suffering with stiff joints can be difficult and even upsetting at times, especially if your condition inhibits you in daily life. Because it is as common - particularly among women as they grow older - ample research has been carried out in order to determine what the causes of joint stiffness might be, and how it can be treated. Read on to discover the answers to some of the most frequent questions, asked by women who are concerned about this condition. Why Do Joints Become Stiff When We Get Older? Unfortunately, with age come a number of changes to the body - some of which affect the functionality of the joints. Between each joint there is cartilage and lubricating fluid, both of which decline as we grow older. When these two components decrease, the joints can feel stiffer and flexibility is worsened. This occurrence is exacerbated by the fact that sufferers are not likely to undertake regular exercise - an action which can encourage mobility and supple joints. What Else Can Cause Joint Stiffness? Arthritis. There are a few different types of arthritis, the most well-known being rheumatoid and osteoarthritis. The deteriorating ailment causes an unexplained inflammation of joints, which can lead to pain and stiffness. Gout. A less common type of arthritis, gout often develops as a consequence of poor health, affecting the activity of your kidneys; alcohol, diet, and exercise are all important factors. Injury. If the body experiences damage in an injury such as a fall or car accident, the affected areas are likely to ache, and joints can become stiff. Bursitis. This condition involves the swelling of the sac of fluid which exists between the bones, acting as a cushion. It can occur because of repeated strain such as through exercise or gardening. Can Joint Stiffness Be Undone? Depending on the reason for your stiff joints, usually it is possible to relieve the condition, if not treat it altogether. While many types of arthritis are unfortunately permanent, there are a number of management methods which many find successful. Joint stiffness that occurs with injury, gout, and bursitis can all be alleviated, and measures can be taken to decrease the likelihood of repeated pain. Can I Treat Stiff Joints at Home? Natural remedies. There are many herbal preparations which can be successful in reducing inflammation, pain, and stiffness. These include capsicum, ginger, and turmeric. 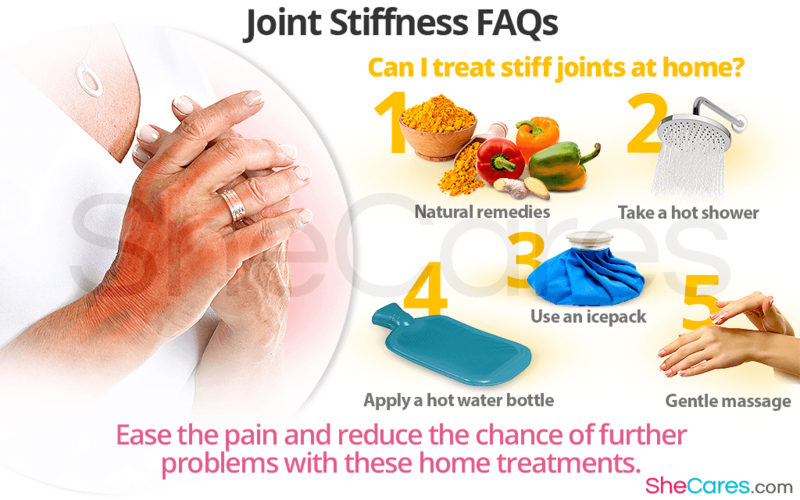 What Medication Can I Get for Joint Stiffness? Non-steroidal anti-inflammatory drugs (NSAIDs). These are available in the form of tablets or a topical cream, and work by reducing swelling and therefore stiffness. Pain killers. Ibuprofen, paracetamol, and tylenol are all popular over-the-counter drugs which provide fast and effective pain relief. Evaluating the different stiff joints causes is suggested to better enable you to find an appropriate treatment or solution. Many women struggle to understand why they might be experiencing this difficult condition, and so awareness of some of the most popular questions can be helpful should you ever be faced with joint stiffness.